CAPE CANAVERAL, Fla. (AP) — The six space station astronauts finally got their Christmas presents Sunday with the arrival of a privately launched supply ship that took an extra month to soar. The spacemen opened the capsule a day early and started removing items, as soon as the Orbital Sciences Corp. vessel was moored safely at the International Space Station. Packed inside were 3,000 pounds of groceries, equipment and experiments, as well as eagerly awaited Christmas gifts from their families back home and some fresh fruit courtesy of NASA. Among the first things out: ants that are part of an educational project. NASA is relying on private industry to keep the orbiting lab well stocked in this post-shuttle era and, in three or four more years, possibly supply rides for U.S. astronauts as well. This was Orbital Sciences' second shipment. The Virginia company was supposed to make the latest delivery last month, well before Christmas, but had to wait for reasons beyond its control. A space station breakdown in mid-December took priority, and NASA bumped the flight to January in order to repair the disabled cooling system at the orbiting outpost. Then frigid weather at the launch site at Wallops Island, Va., forced a delay. Then a strong solar storm interfered. Everything finally came together for a smooth liftoff on Thursday. 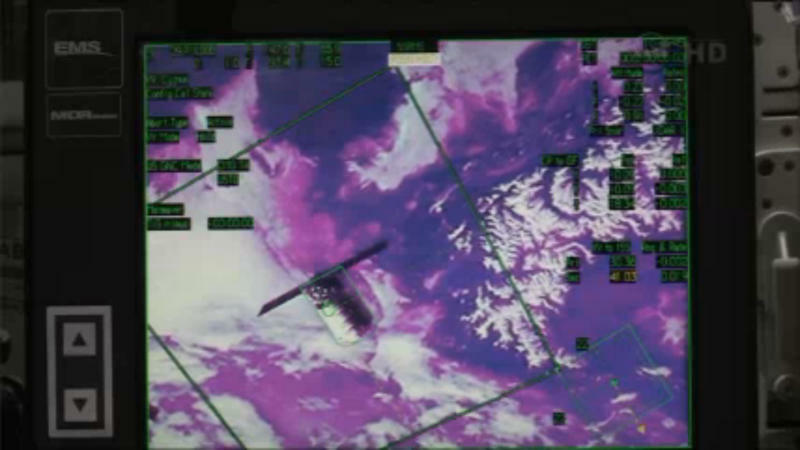 Flight controllers for Orbital Sciences, wearing red company shirts, broke into applause when astronaut Michael Hopkins used the space station's main robot arm to grab onto the Cygnus capsule, more than 260 miles above the Indian Ocean, northeast of Madagascar. 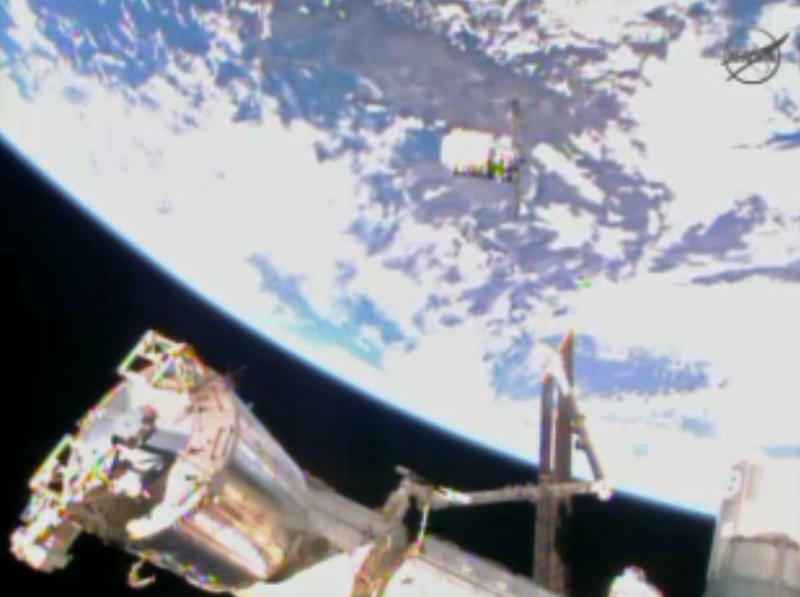 Within two hours, the capsule was bolted to the station. And four hours after that, the astronauts threw open the hatch. Because of the long day, the astronauts were supposed to wait until Monday before opening the capsule. But with presents from their families awaiting them, they couldn't resist. As a holiday treat, NASA stashed away the fruit for the two Americans, three Russians and one Japanese, and Orbital Sciences included a few surprises of its own. "It was difficult keeping up with you today," Mission Control radioed. "You guys were blazing." Orbital Sciences conducted a test run to the space station last September. This is the first official supply run under a $1.9 billion contract with NASA. "I've been up here on station for about 3½ months," Hopkins said, "and I've seen two Orbital vehicles in that time, and I think that's very impressive. So congratulations to everyone." As before, the Cygnus will be filled with trash and cut loose for a fiery, destructive re-entry, in mid-February. NASA is paying Orbital Sciences and the California-based SpaceX company to supply the space station. SpaceX will make its fourth delivery next month, launching from Cape Canaveral. Russia, Japan and Europe also make periodic deliveries. Russia is the lone means of astronaut transport, however, until SpaceX or another American company is able to fly humans. NASA estimates that should occur by 2017. This Cygnus is named for the late shuttle astronaut C. Gordon Fullerton, who helped conduct air-launched rockets for Orbital Sciences in the 1990s. He died in August at age 76 following a stroke. Sunday's successful linkup is a testament to Fullerton's career, both Hopkins and Mission Control noted. "Gordo was an American hero," Mission Control said.